Wow. Roofers can be amazing. This condo project comprises seven formerly distinct buildings. The first step of the project was to put on a new roof over the entire set of buildings. The theory is that you don’t want to start doing new work inside until you have a nice tight roof to prevent water from entering. 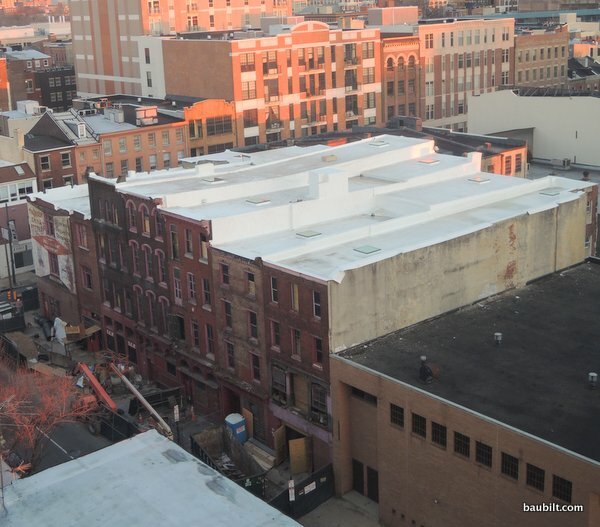 A crew of about a dozen roofers stripped the entire original roof (many layers of nasty asphalt roofing material), did deck repairs, and put down a continuous membrane over the whole thing, all in about a week. It was a marvel to behold. Here’s the finished roof. 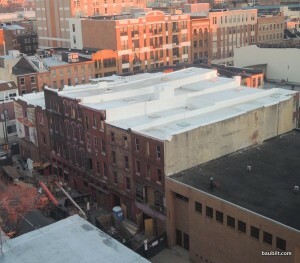 Pristine roof membrane covering seven formerly distinct buildings. Furthermore, they did this on a tight city street seven stories up. The trick is to set up a chute from the roof top to a dumpster below and to have 2-3 people dedicated to moving the debris off the roof into the dumpster(s). This type of roof is sometimes called a “rubber roof.” The material is made of a synthetic rubber (EPDM, usually) and comes in a roll. It can be seamed reliably by overlapping layers and using an adhesive that essentially fuses the material. Think of this as a continuous rubber membrane draped over the entire seven buildings. Of course one tricky problem is how you get the water off the roof. In city settings like this, you can’t just run it off onto the ground. You also have to get it off the middle of the roof, not the edges, because of the way the roof pitches work. As a result, there are central drains on the roof sections, with cages over them to prevent debris from entering. These must be plumbed into the city storm water drainage system. We’re shouting distance from the Delaware River, so my guess is that the drain runs into the river quite nearby. 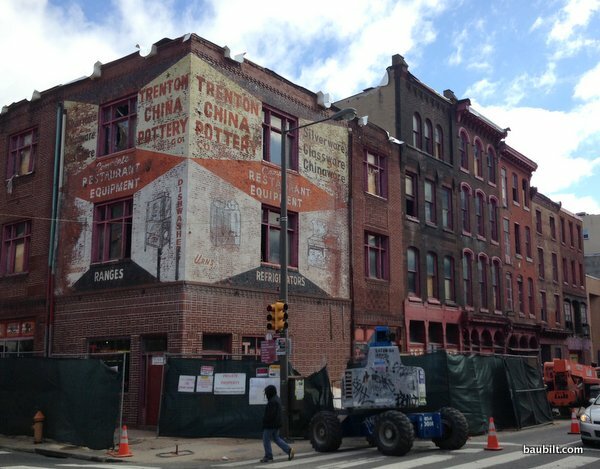 One of my questions about this project was how they were going to treat the facade, particularly the signage that had been painted on the brick at the corner of Arch and 2nd Street. 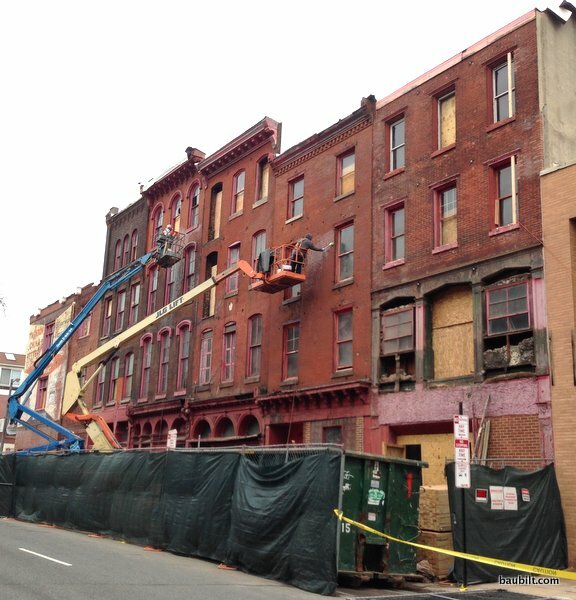 Today, I noticed a masonry restoration contractor pressure washing and manually scrubbing the facade. You have to be careful with brick, as you can erode the hard protective layer of the brick if you use too much pressure or use an abrasive. My guess is that they will re-point at least some of the brick — the really tedious and expensive process of replacing the mortar between bricks on the outer surface of the wall. We’ll see. I’m also very curious to see how they handle the windows — my guess is we’ll just see entirely new windows.